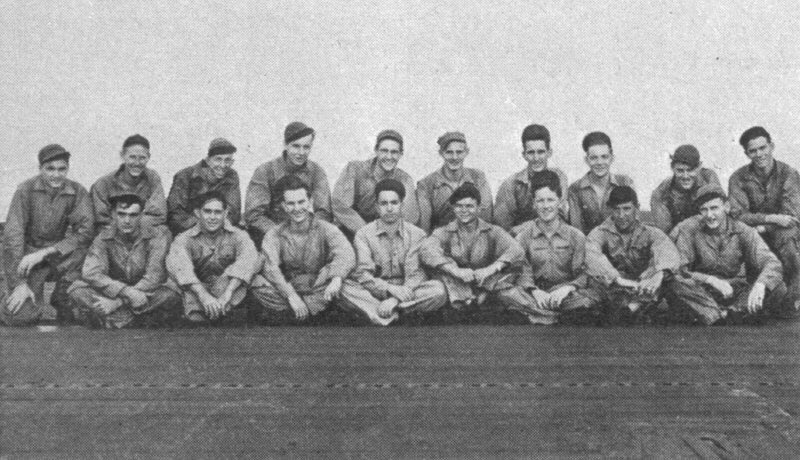 Many of the men of VC-27(I) became members of VC-27(II). Jewel, Joseph W, Jr., Ens. Left to right, front row: R. J. McCray, ARM 3/c; W. Spain, ARM 3/c; A. A. Wilson, ARM 1/c; R. Snider, ACRM; J. W. Dunn, ARM 1/c, F. E. Da?, ARM 2/3; G. H. Turner, ARM, 3/c; R. D. Helin?, ARM 3/c. 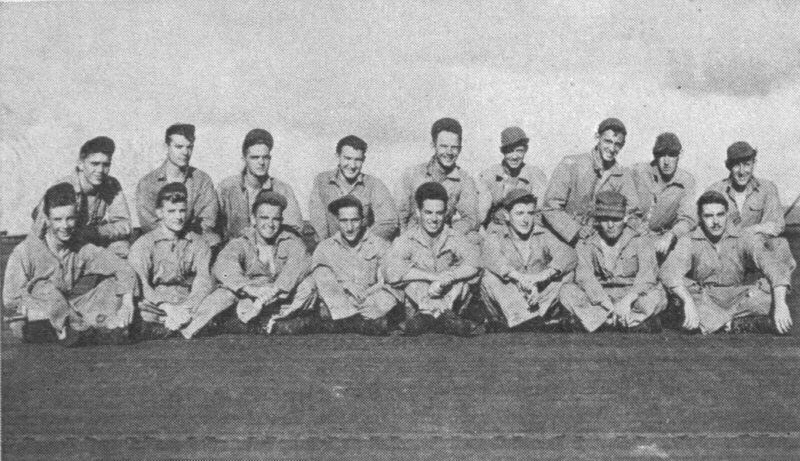 Back row: R. G. Eshelman, ARM 3/c; S. C. Jones, ARM 2/c; W. W. Hill, ARM 2/c; William Patrick Simmons, ARM 3/c; R. E. Dobyns, ARM 1/c; P. J. Yod?, ARM 3/c; Lionel Arceneaux, ARM 2/c; H. F. Johnson, ARM 3/c; G. W. Blessinger, ARM 3/c; C. Hogan, ARM 3/c. 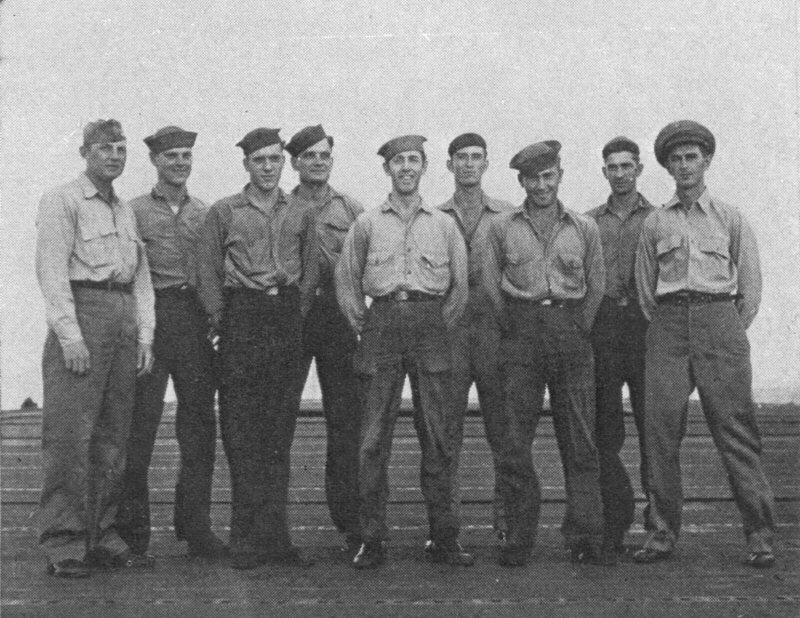 Left to right, front row: H. C. Larsen, AOM 2/c; R. Ripley, AOM 2/c; D. H. Simons, AOM 3/c; Lloyd LeBlanc, AOM 1/c; F. G Norman, AMM 2/c; R. E. Phillips, AOM 2/c; W. J. Luecht, AOM 2/c; G. A. Lewis, AOM 2/c. Back row: L. C. Weimer, AOM 1/c; W. W. Perkins, AOM 3/c; R. L. Morrison, AOM 2/c; T. A. T?pen, AOM 1/c; N. J. Bussey, AMM 2/c; C. Jacobsen, AOM 1/c; D. M. Sawyer, AMM 3/c; H. E. Roache, AMM 2/c; J. E. Scholl, AMM 2/c. Left to right: N. E. Spies, ACMM; J. J. Trenka, AE? 1/c; J. T. Jackson, AM 1/c; W. J. Pickett, PR 1/c; P. C. Warner, Y 2/c; G. A. Dalton, AMM 1/c; W. S. Sinkiewicz, AMM 1/c, P. H. Walker, AF? 1/c; William A. Moye, ACOM.